Those who possess a brown thumb, rejoice: cosmos flowers can grow in your garden in spite of you. In fact, these flowers prefer a bit of neglect. As an added bonus, cosmos plants provide height without ever flopping over, no supports required. Discover what these tough, pest-free annuals can bring to your landscape from early summer until frost. 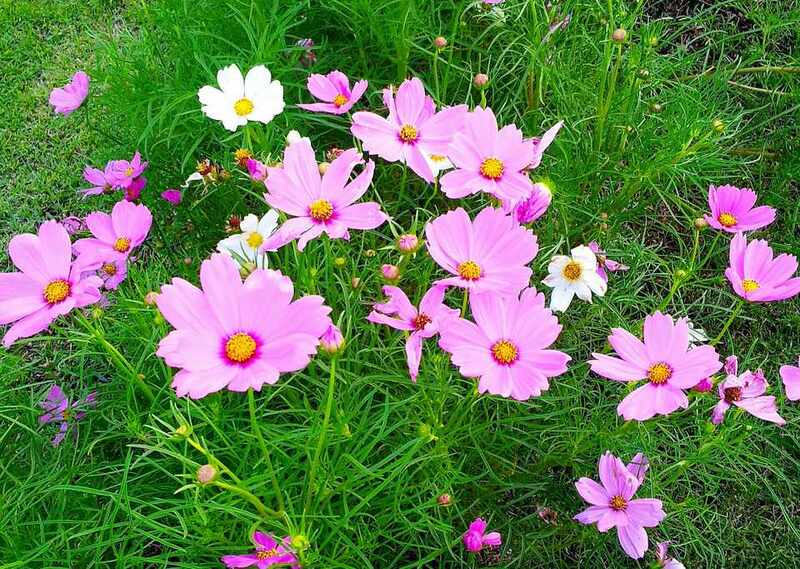 Cosmos belongs to the family Asteraceae, a broad family of flowering plants that includes more than 20,000 species. There are at least 20 species of cosmos, including the North America native Cosmos sulphureus and the popular garden flower Cosmos bipinnatus. Also known as Mexican aster, common cosmos plants will grow as an annual plant in all regions. Many cosmos flowers sport lacy foliage similar to ferns or asparagus that is beautiful in its own right. Petals of single varieties surround a small yellow pollen disk with a simple ray form; double varieties may resemble little carnations. A wide range of color options is available for the gardener, including all hues of pink, red, yellow, and orange. White and picotee colors are also sold. Pay attention to mature height information on the seed packet, as the size of plants can vary from 12 inches to five feet. Cosmos flowers are easy to grow by direct seeding in the garden. Plant them after the date of your average last frost, but if you accidentally plant them too early, don’t worry: as a self-seeding annual, cosmos plants “know” when to germinate, and the seeds won’t suffer from exposure to frost. Cosmos is one of those flowers that likes to bask in full sun from dawn until dusk. Dappled shade may result in lanky plants with fewer flowers. If you have an area of the garden where the soil isn’t quite what it could be, and you’re running low on soil amendments, you can plant your cosmos here, as long as the site is sunny and well drained. Scatter the seeds across your planting site, drag a rake across the seed bed to help the seeds come into contact with the soil, and look for germination after about a week if soil temperatures are at least 70 degrees F.
Withhold fertilizer from cosmos flowers. Too much fertility encourages excess foliage at the expense of blooms. Water sparingly after plants are established. In spite of their delicate appearance, cosmos plants will shine on triple digit temperature summer days for days without a drink. Cut plants in half when seed pods outnumber flowers to rejuvenate plants for the second half of the growing season. If you don’t mind leaving cosmos plants in place for a month after frost, birds, especially goldfinches, will continue to feast on the seeds. Cosmos flowers are a butterfly garden no-brainer. They attract many butterflies including monarchs, painted ladies, and swallowtails. Use cosmos plants as backdrops in your mixed flower borders, and make vegetable gardens ornamental with some cosmos plants. Plant dwarf cosmos varieties in the container garden, such as the one-foot tall Ladybird mix. A good recipe for container gardens is 1/3 tall plants, 1/3 mounding plants, and 1/3 trailing plants. A few cosmos flowers fulfill the tall plant requirement. Complete the recipe with narrow-leafed zinnia (mounding), and moss rose (trailing), which also love full sun and hot weather. Plant cosmos seeds en masse in uncultivated meadow areas of your property. Planting 15 pounds of cosmos seed per acre will yield a pleasing plant density. For more variety, Mix a cosmos wildflower planting with other flowers with similar growing requirements, like California poppy, blanket flower, black-eyed Susan, and cornflower. Enhance your cut flower garden with a generous planting of cosmos flowers. The ferny foliage adds bulk to bouquets, allowing you to use expensive and harder to grow cut flowers like roses and lilies sparingly. After harvest, you can expect your cosmos flower bouquet to last about a week. Remove foliage below the water line to prevent decaying leaves from fouling the water. Plant breeders continue to expand the available offerings of cosmos with earlier blooming varieties, more compact plants, unique flower forms, and improved vibrant colors. Bright Lights: Orange, gold, and yellow mix with some semi-double flowers. Chocolate: Rich maroon color; available as plant starts only as seeds don’t come true to parent plant. Daydream: Pale blush with a crimson eye. Double Click: The fluffiest of the doubles, available in white, pink, and cherry shades. Seashells: Fluted petals make it an unusual addition to the vase. Sonata: Early to bloom and heavy flowering in pink, white, or scarlet.